ĐIỆN BIÊN — Many hundred-year old trees in Nà Pen Forest in the northern province of Điện Biên have been illegally logged, putting the future of the old forest at risk, the Vietnam News Agency reported. Located in Nà Nhạn Commune, Nà Pen is the largest forest in the province but high demand for wood to build houses and ineffective forest management were leading to further deforestation. Around 5km from Nà Pen, it is easy to hear the chainsaws being used by illegal loggers as well as the sound of the trees coming. The situation has caused a stir in the area. It is easy to see the damage that has been caused to the forest. Tree stumps with diameters of between 20 and 25cm dot the area and the cuts still look fresh. Venturing further into the forest, hundreds of square metres have been illegally logged. According to a H’Mông couple living in Nà Pen 1 Village, the forest was managed by residents in Nà Pen 1, Nà Pen 2, Nà Pen 3 and Nà Pen 4, but many local people still chopped trees down to build houses. It took more than 10cu.m of wood to build a traditional house of the H’Mông ethnic minority people, and took 4-10 days to exploit such a huge amount of wood, they said. The trees are cut into pieces right at the scene and are then transported to the villages by motorbikes. Approaching another part of the forest, a larger area has been cleared for crops and is fenced in with wood from trees that were illegally cut down. In order to create such a large area for farming, illegal loggers had to cut down a large number of trees which could have taken up to a month to do. Further in, a group of seven people were found using chainsaws to cut down trees and split them into small pieces of wood. They said they were from Nà Pen 2 Village and needed wood to build houses. At the scene, there were 10 blocks of wood about 4m in length and 20cm in width. It looked like a storm had ripped through the forest. As this destruction continues, local authorities and forest management forces seem to be turning a blind eye to the situation. Chairman of the People’s Committee of Nà Nhạn Commune Quàng Văn Sơn said he did not know the forest was being destroyed due to illegal logging and land clearance for crops. After watching photos and video clips of forest destruction, Sơn said local authorities would work to find the violators and punish them. Nà Pen Forest covers an area of over 1,300 hectares. In early 2018, residents signed a commitment not to exploit forest land or wood. However, lack of awareness together with loose management and supervision had led to the forest’s destruction, according to local authorities. 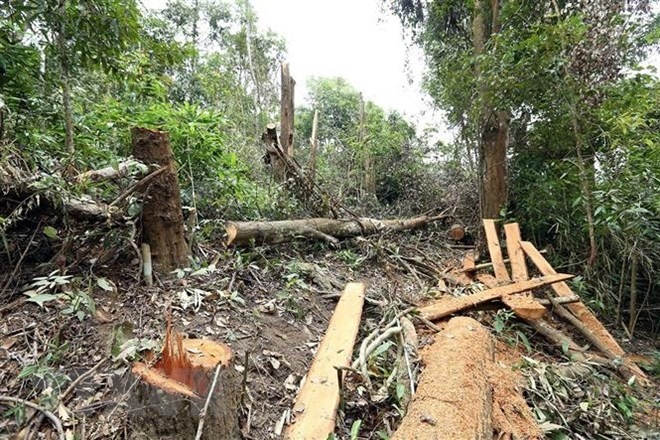 Head of the Forest Management Division in Điện Biên District Nguyễn Cương Quyết said the forest was in a remote area and the lack of human resources made it difficult to manage. Local people also farmed the slopes and destroyed the forest to make space for crops, he said. Deputy head of Điện Biên Province’s Forest Management Department Phạm Văn Khiên last week confirmed the problem after carrying out an investigation following the report by the Vietnam News Agency. It was also necessary to make clear the responsibilities of those involved in managing and protecting the forest, he said. The department would also increase patrols to prevent further deforestation and raise public awareness about protecting the forest, he added. Nà Pen is considered a hot spot for deforestation in Điện Biên Province. In 2011, a Vietnam News Agency report also revealed that local people had destroyed many parts of the forest, cutting down centuries-old trees.